(The Hit Squad) 19xx £2.99 ? 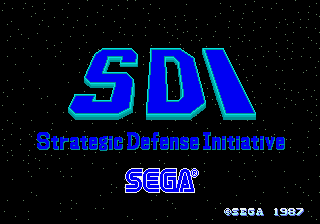 SDI: Strategic Defense Initiative is a 1987 shoot-'em-up arcade game developed by Sega for the Sega System 16 arcade platform. Unusual for its time, SDI has the player assume the role of a satellite, tasked with destroying enemy satellites and missiles. Each level is divided into two "modes" - "offensive" mode, which takes the form of a sidescrolling shoot-'em-up, and "defensive" mode which is built more similarly to Atari's Missile Command. Beating both modes allows the player to progress, however, if the player can destroy all the enemies in offensive mode, defensive mode does not take place. SDI not only gives the player control over the movement of the satellite, but also its aim. This mechanic was implemented in the original arcade cabinet through the form of a joystick and trackball - the joystick moving the player, the trackball moving the crosshair. On the top of the joystick is a button for firing. A perfect game of SDI will result in the satellite being replaced with Flicky. SDI was ported to the Sega Master System in 1987/1988, where western versions were renamed Global Defense. The Master System version, as well as cutting back on the graphical and audio quality, has to vastly reduce the difficulty of the game to match up with a new control scheme - as the console lacks a trackball, the player needs to switch between moving and aiming during play (holding while moving the D-Pad allows the satellite to move, otherwise the D-Pad only controls the crosshair). This makes moving and aiming at the same time impossible. However, the U.S. manual lists an alternate two-controller configuration in which the first controller aims and the second controller moves the satellite. When the game is started in this configuration, the satellite fires automatically. To start the game with two controllers, on the second controller either press Left and or Right and . Activision brought the game to home computers in Europe - the Amiga, Amstrad CPC, Atari ST, Commodore 64 and ZX Spectrum (not to be confused with S.D.I., an unrelated game also released for the Amiga and Atari ST). These days, SDI is often grouped with another arcade game from the era, Quartet. Both were released as part of Volume 21 of the Sega Ages 2500 series, Sega Ages 2500 Series Vol. 21: SDI & Quartet: Sega System 16 Collection for the PlayStation 2. SDI & Quartet: Original Soundtrack contains the official soundtrack of both games. Note:According to Sega Ages 2500 Vol. 21, Masaki Kondo (近藤 正樹) was a "Designer", Katsumi Tojo (藤乗 勝巳) was the "main programmer" and Eishi Kawatake (川竹 英士) was also a programmer. All three worked on Galaxy Force too. Main article: SDI: Strategic Defense Initiative/Magazine articles.